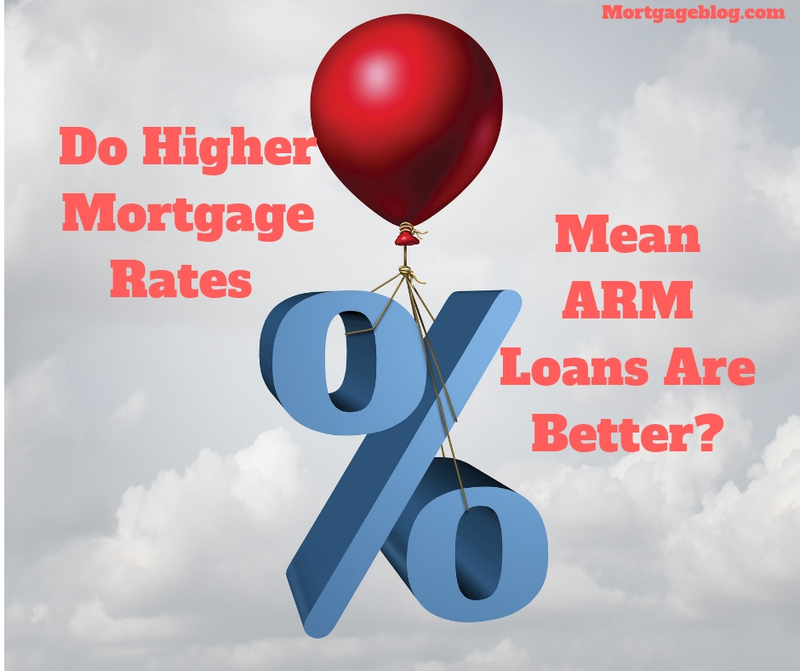 Do Higher Mortgage Rates Mean ARM Loans Are Now Better? Are rising mortgage rates and housing prices bringing back the Adjustable Rate Mortgage (ARM) loan? Well, they never completely went away, but they’re making a comeback. Sort of. Before the mortgage melt-down, at the peak of the market in June 2005, ARM loans accounted for 77% of all loans made in the US according to CoreLogic. They accounted for only 4% of all the loans in the US by the end of 2016. Quite a swing but not surprising. Fixed rates were under 4% for a long time, and there wasn’t a good reason to consider an ARM loan over a fixed rate. But as fixed rates creep closer to 5% and home prices continue to increase, the percentage of ARM loans has begun to climb. While ARM rates have also increased, they remain well below current fixed rates. Per a report by Ellie Mae, at the end of July 2018, ARM loans climbed to 6.6% of all mortgages originated in the U.S. The break down between loan types is: 7.2% of all conventional loans were ARMS, while .5% of new FHA loans and .4% of new VA loans were ARMS. CoreLogic statistics show the percentages increase in higher priced states and the pricier counties within those states. In July 2018, 12.3% of all mortgage loans in California were ARMS, up from 11.1% in July 2017. While in Orange County, July 2018 saw 19.4% ARM loans compared to 16.1% the prior year. In Alameda County, the total for July 2018 was 28% up from 25% last year, while in San Francisco County, ARM loans rose to 40.1% this July – up from 36% a year ago. But how do you know if the ARM loan is the right loan for you? First, let’s review ARM loans, so you understand how they work. Remember, the ARM loan took the blame for much of the financial meltdown. Specifically, the notorious Negative Amortization loan, with its low teaser starting rates, which were popular – and dangerous – for homeowners at that time. Thankfully, the negative amortizing loans no longer exist. You can get a 5-year, 7-year, or10-year adjustable loans today. They have a fixed rate for 5, 7, or 10 years and then the interest rate adjusts annually after that. They come with a maximum rate increase cap for each time the interest rate can change and a lifetime cap. When the initial fixed rate first adjusts it will be capped at the lesser of 2% above the initial fixed rate, or the ‘fully-indexed’ rate. The fully-indexed rate is calculated by taking the index that the ARM loan is tied to (each ARM loan specifies the actual index used before you ever lock in the interest rate) and adding a pre-set margin (also defined before you lock in the interest rate) to that index value. For example, if an ARM loan is ready to adjust and uses the 1-year LIBOR as the index (currently 2.8455) with a margin of 2%, then the fully-indexed rate when it adjusts will be 4.85 (1-year LIBOR + 2%.) If the starting rate for the ARM loan was 3% or higher, then this fully indexed rate is less than 2% higher than the starting rate – and the rate will adjust to 4.85% on the anniversary date. Note longer initial fixed rate periods for ARMs have higher initial interest rates. So the 5-Year ARM will be less than a 7-Year ARM, etc. Another critical thing to know about ARM loans today – they rarely carry a prepayment penalty. You can sell your home and pay off the mortgage whenever you want, without any additional cost as a penalty. This is also something you will know before you ever lock in the interest rate. Qualifying for an ARM loan isn’t easy. You can’t use it to get a mortgage if you have high debt-to-income ratios or a below average credit score. Pre-meltdown, the ARM’s lower initial monthly payments were used to squeeze buyers into loans and homes they eventually couldn’t afford. Today, lenders apply very stringent loan qualifying guidelines to every borrower to determine if they can afford the mortgage today AND in the future. When qualifying borrowers for an ARM loan, lenders have to make sure you’re financially stable enough to handle the adjusting interest rate. Depending on the type of ARM, borrowers are qualified at a rate above the initial starting rate. For 5-Year ARMs, qualifying is the greater of the initial note rate plus 2% or the fully indexed rate. For 7 and 10-Year ARms, it’s the greater of the initial note rate or the fully indexed rate. And minimum credit score requirements can be higher for ARM loans as well. When Should You Consider an ARM? Everyone’s financial and, for that matter, real estate needs are unique. The right answer for you won’t be the correct answer for someone else. An ARM loan work for you if you buy a small home or condo with plans to move to a larger home when your family grows. Or if relocation is a part of your chosen career and you’ll be moving to another city within a few years. However, consider your options carefully as any number of things can alter your original plan. A sudden job or life change could mean staying in your home, and loan, longer than you anticipated. Or rising interest rates may be the deciding factor for staying put. If you do choose an ARM loan, consider a longer fixed period than you might need to buffer against any unforeseen changes.